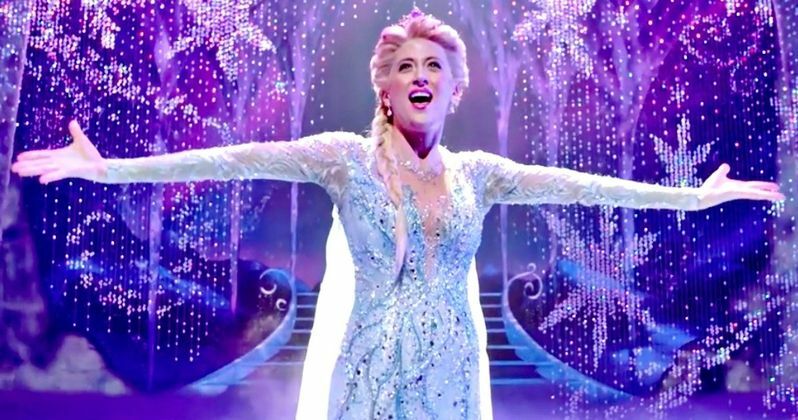 Walt Disney Theatrical Productions has debuted the first trailer for Frozen: The Musical, as the Broadway stunner has its official opening at the St. James Theater. The play first debuted during a "pre-tryout run" at Denver's Buell Theater in the fall of 2017, with the official Broadway previews opening on February 22, 2018 before the official premiere today. It was reported that roughly 30% of the play was re-written between the Denver trial and the Broadway previews. Just like the hit 2013 animated movie of the same name, Frozen: The Musical is the timeless tale of two sisters, pulled apart by a mysterious secret. Both are searching for love. They just don't know where to find it. Created for the stage by an award-winning team, this stunning new production comes alive on Broadway through exquisite stagecraft and deepens the beloved story with twice as many songs as the original film. Discover that love is a force of nature at new Disney musical Frozen. The new musical stars Broadway veterans Caissie Levy as Elsa and Patti Murin as Anna. The principal cast members also include Jelani Alladin (Kristoff), Greg Hildreth (Olaf), John Riddle (Hans), Robert Creighton (Weselton), Kevin Del Aguila (Oaken), Timothy Hughes (Pabbie), Andrew Pirozzi (Sven), Audrey Bennett (Young Anna), Mattea Conforti (Young Anna), Brooklyn Nelson (Young Elsa), Ayla Schwartz (Young Elsa), Alyssa Fox (Elsa Standby), Aisha Jackson (Anna Standby) and Adam Jepsen (Sven Standby). While the cast may not be familiar to fans of the movie, the behind-the-scenes team that put the movie together is still largely intact. The play's book was written by Jennifer Lee, who wrote the screenplay for the original Frozen movie, which she also co-directed with Chris Buck. The music and lyrics were written by the original Frozen team of Robert Lopez and Kristen Anderson-Lopez, with this musical featuring nearly a dozen brand new songs, along with classics from the original film like "Let It Go." For fans who can't make it to Broadway, you can still experience a small part of the play each week, with the production releasing new songs every week from the production. The original Frozen movie is still the highest-grossing animated film of all time, pulling in $400.7 million domestic and $1.276 billion at the worldwide box office, from a $150 million budget. Along with the trailer, we have the first four songs that have been released by Walt Disney Theatrical Productions. The songs are"Monster," performed by Cassie Levy, which shows a side of Elsa fans haven't seen before, "What Do You Know About Love?" by Cassie Levy and Jelani Alladin, "Dangerous to Dream" by Cassie Levy during Elsa's coronation and a studio recording of "True Love" by Patti Murin and Robert Lopez. For those who want to download these songs or add them to your Spotify or iTunes libraries, you can visit FrozenTheMusical.com/Music. In the meantime, take a look at this trailer and the new songs from Frozen: The Musical below.